I have a fascination for those multi layered stamps...but they take work and practice. This time I decided to just go with the practice flowers and I made them into cards. I had to trim them out, since I stamped them in odd directions not quite knowing how they'd lay out. They're not perfectly stamped, but they make a sweet card. They'll be hitting mailboxes later this summer. I use my iphone for photos, and the Iphone can skew the edges of a card in a wonky way. Its been irritating me for a while now. I did discover that if I photograph the card flat instead of standing up it will lessen the wonky effect. I have a few 12 x 12 papers I use for backgrounds. 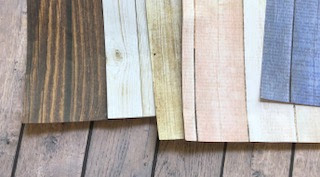 A few days ago I went to a big box store to get some 110lb cardstock in white that I used for my bases and while I was in the paper aisle I found more woodgrain 12 x 12 sheets for photographs. They are so fun, white washed, distressed, blue, pinks and a really dark one are being added to my backgrounds stash. I am visiting my Dad, so there are some pre posted posts coming your way. three fantastic cards, Cat - difficult to choose a favorite - those woodgrain papers are great too! have a good time at your Dad's! I love them! Is this an Altenew Rose? How did I miss this?! LOVE these roses & your cards! The stamping looks great to me, Cat! Hope you're having fun in CA, but wish your dad was farther north!